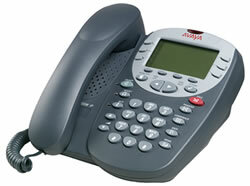 Note: Avaya 4610 IP Hardphone - discontinued - only the SW version is available. 5 x 29 character (168 x 80 pixel 4-grayscale) display. IP Office Interactive menus can be invoked from appropriately programmed DSS keys, and these menus will utilize the 6 programmable feature keys and the ‘Exit' fixed function key. The 4610SW includes all the above features plus an integrated Ethernet switch for PC connection.